Democracy Vs. Dictatorship; What Do We Want? When in 1956 SWRD Bandaranaike introduced the politics of religion and nationalism into the body politic of Sri Lanka, he not only announced the advent of a new era of politics and electioneering, he unleashed a force, thereto dormant, that took the land by a storm of ethno-religious frenzy, it signaled a departure from secular socio-political conversation. Ironically enough, it was the infamous Buddharakkhita, whom Bandaranaike chose to direct this ethno-religious election campaign and who eventually ended up as the leading conspirator of his own assassination. Histories of all lands are replete with such cruel ironies. But taken in the context of what followed the ’56 transformation, the brutal offspring of that revolution and the unbridgeable gulf between the two main ethnic groups in Ceylon, Sinhalese and Tamils, that irony has contributed in very harsh dimensions to her social fabric. The unholy entry of the Maha Sanga into an arena that had been dominated by laymen and women, may have changed its landscape forever. Unlike in Western democracies which had had this rule of government free of religion, of secular constitutions, with the Bandaranaike doctrine of common man’s politics, ethno-religious politics had an inroad that couldn’t be undone by the following years; they were more violent and terribly volatile than the preceding decades of harmonious relationship that existed between the peoples of the two ethnic groups. 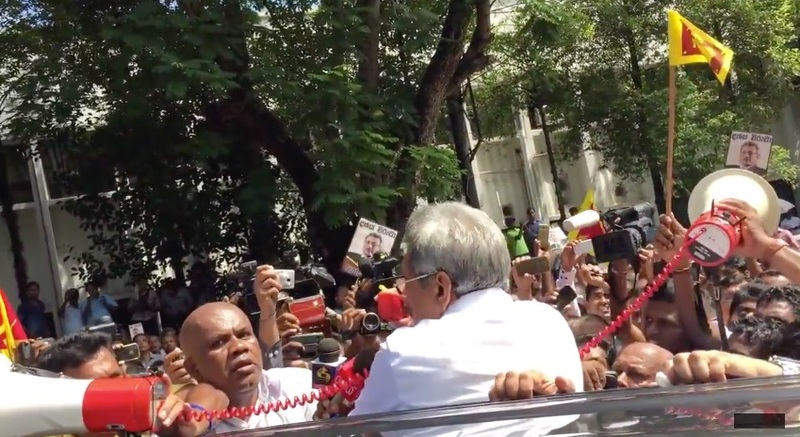 It may be unfair to attribute this declining cultural condition to the Bandaranaike policies, but when historians try to decipher the true state of the once-dynamic and friendly coexistence, they will find that Bandaranaike and his bedfellows unquestionably crossed the Rubicon in the land’s ethnic conglomerate. Quite comfortably or uncomfortably for the vast majority of Sinhalese Buddhists in the country, there wasn’t a single member of non-Buddhist order of clergy so intricately and wholly involved in the political currents in the country. A cruel assassin of a Prime Minister set the pattern and other members of the same religious order put their lock, stock and barrel into it; the holiness of a religion became a product wrapped in a saffron robe lost its holiness; upholding one’s religion should not be in the hands of legislators as much as it is essentially not the exclusive responsibility of a corrupt set of religious leaders. Nevertheless, the vast majority of Buddhists are steeply entrenched in their own history and their Great Chronicle (Mahawansa), which was written by Buddhist Monks at the behest of the King or Queen who reigned at the time, initially to please that Monarch, honestly believe that the wrongs done unto them by the rule of colonial powers for nearly half a millennium have to be undone. That paranoid mindset cannot be discarded as trash; it couldn’t be disregarded as unsophisticated; the neo-liberals who theorize that a secular constitution is the answer to all ethnic issues must find other ways of expressing themselves in terms that relate to this segment of our population. They represent almost 80% of our voting population. The ’56 transformation has had its lasting and unchangeable effects. Its effects were not confined to religion; its generational impact was not limited to mere economic issues, they had their unmitigated influence on the country’s culture and philosophical psyche of the people. An emergence of a new Ceylonese, closely entwined with his religious predominance and misplaced patriotism; his expression of that predominance and patriotism was more violent than tolerant, more wile than sensible and definitively more shallow than profound. Multiple eruptions of violence and mayhem around the country where innocent Tamil families were subjected to unspeakable humiliation and slaughter were manifestly present during those riotous days of infamy. What started in 1957 as a protest against the Tamil leaders who performed Satyagraha in the North and then at the Galle Face Green, right opposite the then House of Parliament, was followed by violence against Tamils living outside the Northern peninsula and culminated in 1983, the year in which the strengthening of Tamil militancy and reorganization of their fight against the Sri Lankan government security forces. Participation of Buddhist Monks in these riots is beyond question. In fact most of these riots were led by them from the front and association of Buddhist Monks with these unholy wars against an ethnic minority ran diametrically opposite to the noble Teachings of the Buddha who was the first of religious leaders who preached Ahimsa (non-violence) as a premier principle of his religion. Polarization of the Sinhalese Buddhist population, while a majority of whom doggedly has been clinging on to violent expression of patriotism and a minority believes in accommodation and reconciliation, defined the ensuing socio-political constitution of this segment of our people. This polarization has been lasting since then. Buddhist Monks who had a say and could say an emphatic no to their cohabitants kept numb and this muted expression in turn was acknowledged by the ‘Gnanasaras’ of the day as a silent yes to this un-Buddhistic conduct. Birth of Buddhist fundamentalism as a direct byproduct of this virulent and misplaced patriotism has changed our society, at least for some year to come. What today’s political leaders have to realize is that this change, whose root cause may be hidden in a web of circumstantial substantiation, has taken root in our collective psyche. It is not possible to un-root such a fundamental element buried in a warped mindset. It may be unwise to expect a change from this elementary circumstance; it may be even laughable to teach non-violence and affectionate thought to a people hell-bent on vengeance and reprisal. Philosophical preaching has no space in a mindset crowded with shallow and superficial patriotism and dogmatic popular religious beliefs. In such a sad setting, what else is left for a political leader whose thoughts are less impure and more ambitious? Bandaranaike’s dream of a common man’s homeland has become a nightmare for minorities. That common man, at least a vast majority of his cohabitants, has consciously and willingly become a pawn in the hands of cruel and deceitful politicos. An astute politician would not hesitate to exploit these vulnerabilities of the ‘common man’ and provide fodder to him with ease because such fodder will inflame the commoner’s greed for vengeance. When such emotions and sentiments are manifestly present in a people, talk of dictatorship in the likes of Hitler and Stalin lends itself as easy way for deliverance. A population that was once gripped by the fear of the Liberation Tigers of Tamil Elam (LTTE) and its Masters in Tamil Nadu, India, the government that happened to be in power looks more like a more suitable alternative than one that later provided freedom of expression and movement. The political geography has changed forever and a shrinking middle ground tells the absence of tolerance, reconciliation and accommodation. On the other hand, endurance of nasty and brutally dishonest politicians whose one and only ambition is to attain power and loot the country’s wealth and treasures has become the norm. The moderate voter would realize that usurpation of power depends largely on money, weather ill-gotten or otherwise, muscle-power and an appallingly gullible population. The United National Party, Sri Lanka Freedom Party or any other alternative, if its ambition is to come to power, will have to resort to ungentlemanly (mildly expressed) politics. That is the norm of the day. The choice has become one in between unpalatable and corrupt democracy and unendurable dictatorship. Sri Lanka Has A 2600 Year-Old Culture?